In honor of Chinese New Year which is coming up February 7th, I thought I would post some Chinese characters and tell you a little about them. 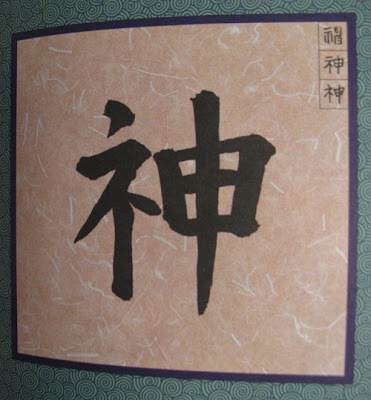 napaboaniya has commented and says this character means "God." eastcoastlife says in the comments that yes it does mean "God" and she puts the character up in her house. Ooo... you are interested in our Chinese culture. That's great. We put up this word in our house as it means God too. Mary, that word Shen means 'God' not spirits. Spirits is 'Ling Hun'.